Recommended Erhu by Hu Hanrou for students on a budget. Crafted by master maker in Shanghai, Hu Hanrou, this Erhu exhibits the fine qualities of the traditional Shanghai style Erhu, exquisite craftsmanship, sonorous and clean sound qualities. With over 40 years of Erhu making experience, Hu Hanrou entered Shanghai National Music Instruments in 1971. She was an apprentice to Wang Genxing, an Erhu master maker. 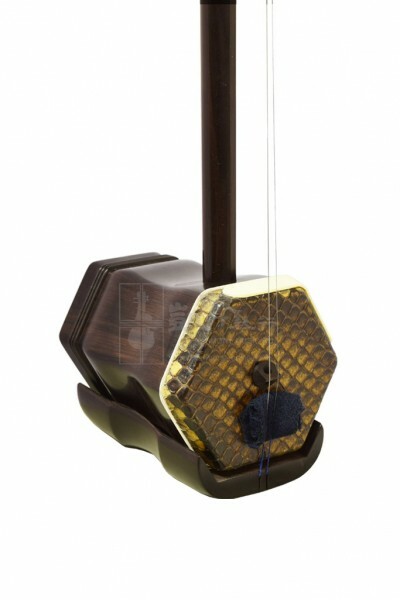 While receiving countless awards from National Erhu Making Competitions, Hu Hanrou crafted this Erhu with Black sandalwood for intermediate students who wants to explore the sounds of Black Sandalwoods. Comes with a bow, a spare string set and bridge, a case and a rosin, this Erhu is an affordable upgrade to any beginners models.